Yesterday I talked about giving wine as a Christmas gift but sometimes that is not always a one size fits all kinda gift. Some of the teachers at school this week received these cute little gift cards from our family. Did you know that these gift card enclosures come as you see them right from Stampin' Up!? They are cut, scored and have the slits to fit a gift card. A little stamping and a belly band and you have a gift that wows. If you are following along you know that I am having a sale on my favorite things plus a free giveaway! To enter to win my favorite stamp sets comment below or on social media and tell me - If you could get a gift card to any store, what would that store be? 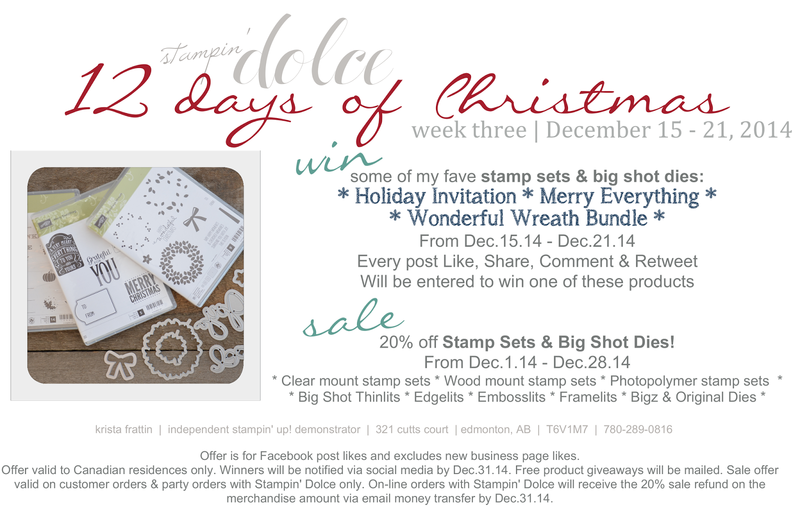 Stamp sets & Big Shot dies are not the only sale I am having this December Check out my blog posts for week one & week two to see the other amazing products I am celebrating with a sale! Thank-you for visiting ~ Have a creative day! China Bulk Wholesale Supplier in Dubai I really enjoy the article post. Much obliged. Imaginative Beauty Schools give meet significance to this branch which incorporates facials,Emily Blunt Face Cream body techniques and make-up imaginativeness.